Hello, beautiful friend. What are you doing to enjoy summer? We are enjoying a leisurely summer of day camp for Aaron, trips to the park, watching movies, lots of book reading, and warm days at the beach. Which explains why it’s been quiet crickets here on The Larissa Monologues. I feel like the summer vibes cause me to get way more laid back with my cooking. I am more relaxed with meal planning, with the occasional pizza night and lots of tried and true recipes. Here are some of my favorite recipes for the summer. I would love to hear what you’re cooking these days. Do you have any good summer recipes? Please share them in the comments! Hi, I'm Larissa. I'm glad you're here! I'm a Jesus follower, spiritual director, ministry planter, writer, wife, and mom of three. This blog is where I share life reflections and favorite recipes. 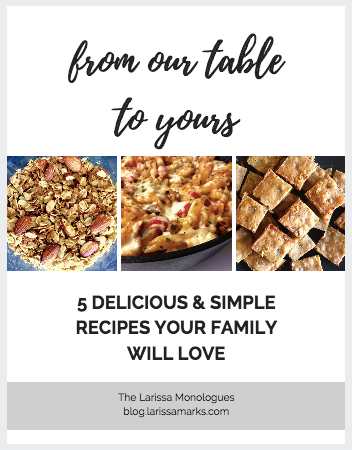 Get Your FREE Recipe Booklet! This blog contains affiliate links. This means that clicking on or purchasing through a link may help me earn a small commission (at no extra cost to you) that helps keep this site going. Thanks for your support! The Fong cousins, all gathered to celebrate and say goodbye to our beloved Popo. It was good to cry, laugh, and remember together. First stop in Los Angeles: Benny’s Tacos. All the carnitas and carne asada, por favor. My belly is so happy right now.